I love ribs, and I love the way they come out of my Masterbuilt electric smoker. Actually, it’s my dad’s smoker but I keep it safely at my house. The problem with ribs is the time. The late-night clean up, after cleaning and rubbing the ribs the night before and cooking six hours, is almost too much. The worst thing to clean is the racks. 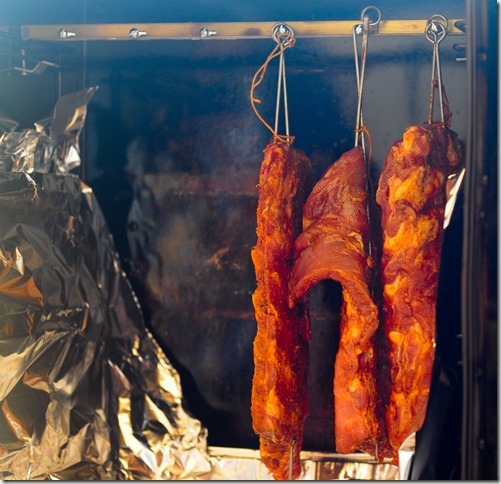 The chromed welded-mesh racks (picture below) sit in the smoker like oven racks. 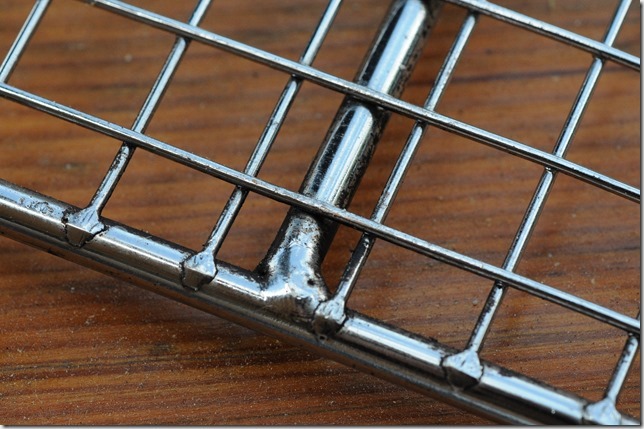 The racks’ many textures make them difficult to clean. My best success is to spray them with cooking spray before using, then soak them in the sink for an hour or two, followed by a brushing, and then often steel wool. They don’t get clean enough in the dishwasher. 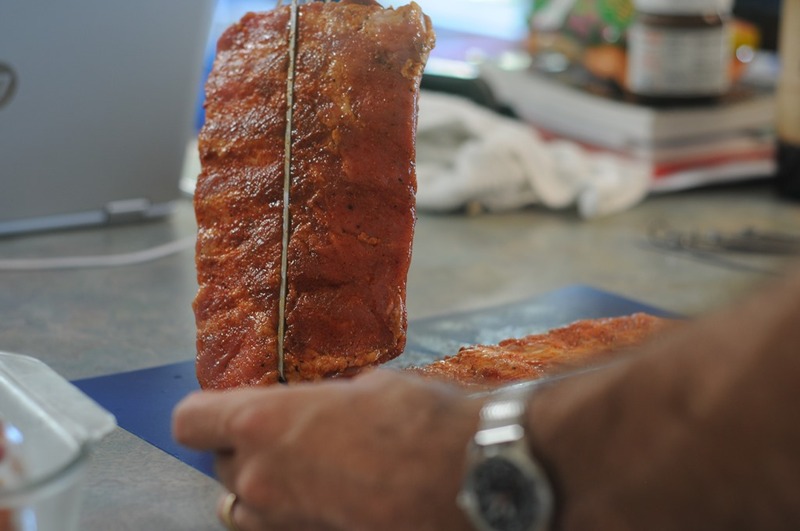 This post is about making ribs without the cleanup headache. My friend Scott owns the same kind of smoker, and provided the first piece of wise council. 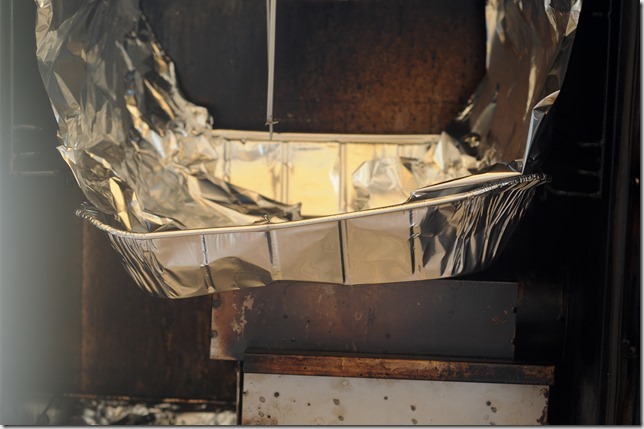 Instead of lining the water pan and drip pan with foil, put a disposable pan aluminum pan in place of the water pan. 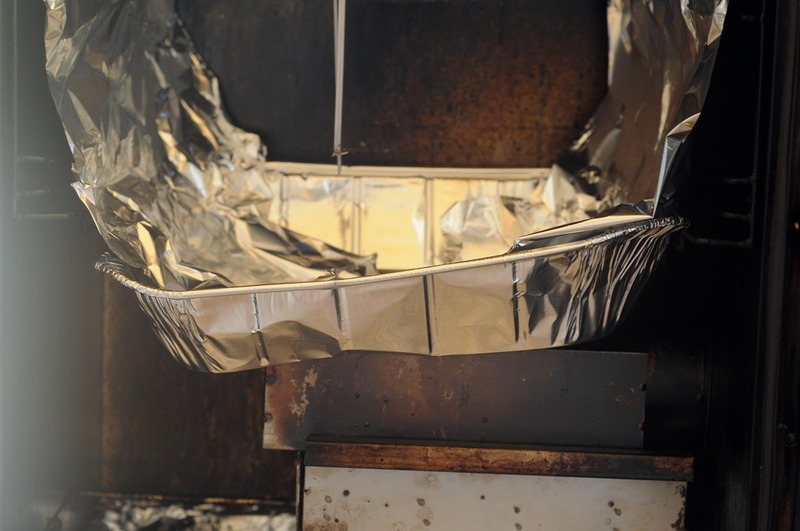 I also hang aluminum foil skirts on the sides of the smoker to keep from having to clean the sides as shown below. I use a 10.5×13 inch disposable pan purchased at Costco. I deform the pans a little to fit better. To dispense with cleaning the racks demands an alternative. I built a hanger to suspend the ribs from near the ceiling. 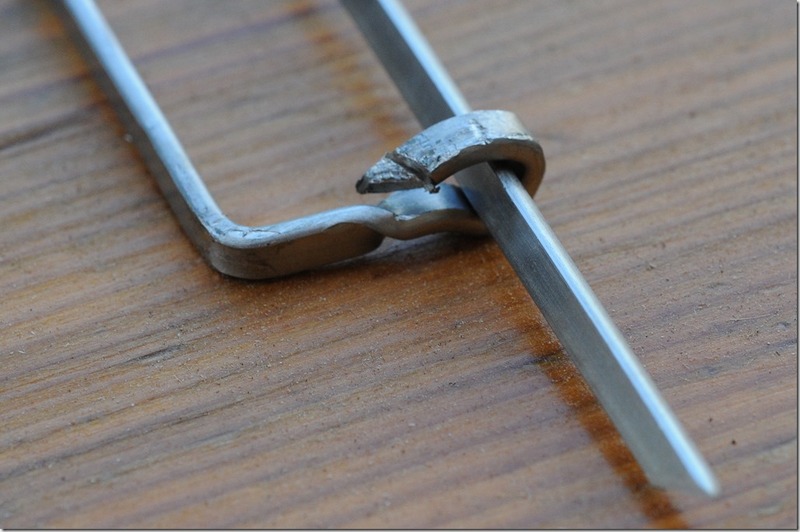 Then, I bent cheap stainless skewers into a shape that holds the ribs along their length. One skewer is native, unbent. The other has the end bent up and then into a loop. 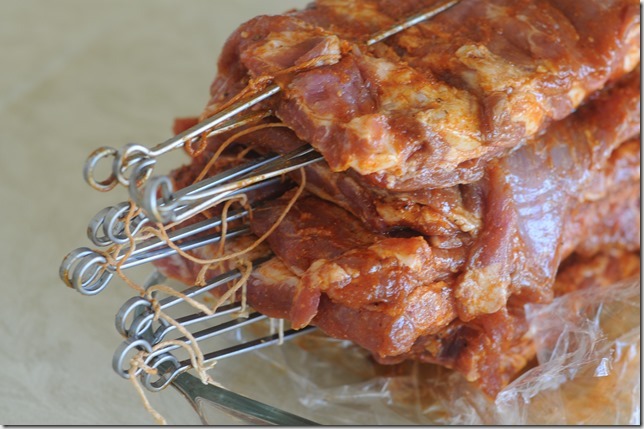 Then the two skewers interlock. 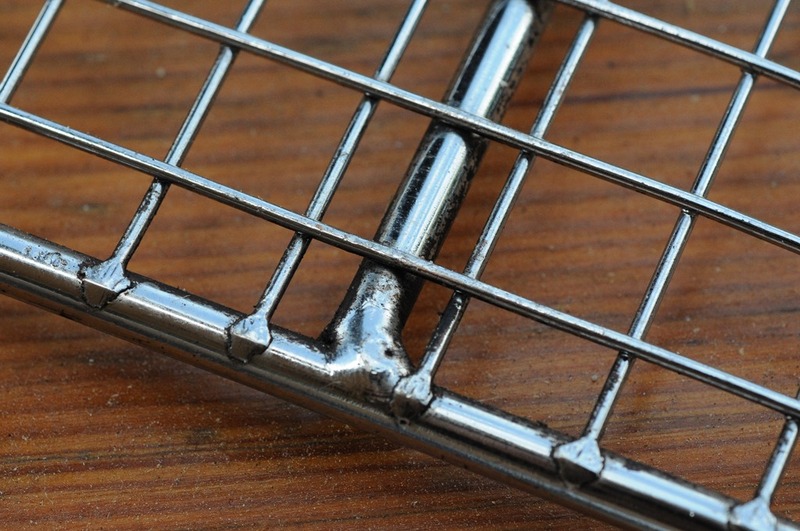 String tied at the top holds the ribs in. 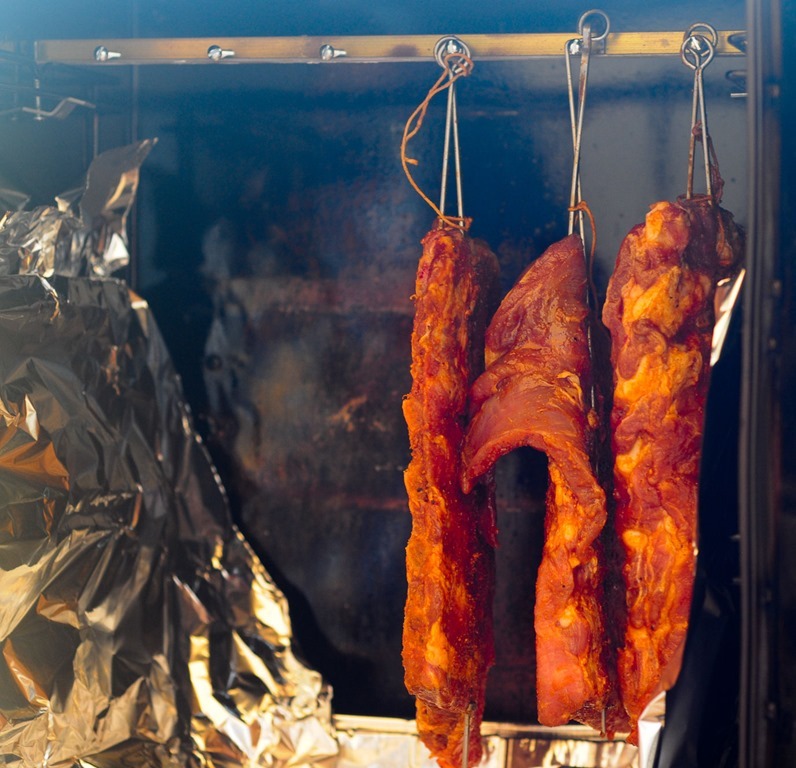 Each pair of skewers holds a half rack of ribs, squeezed. My design keeps the ribs upright with minimal risk of falling. I align the loops at the top of the skewers so that they are both held. I built a hanger out of piece of brass angle iron. I drilled and tapped along the length, and ran 2-inch 8-32 screws through, leaving plenty of length to hang the holders from. 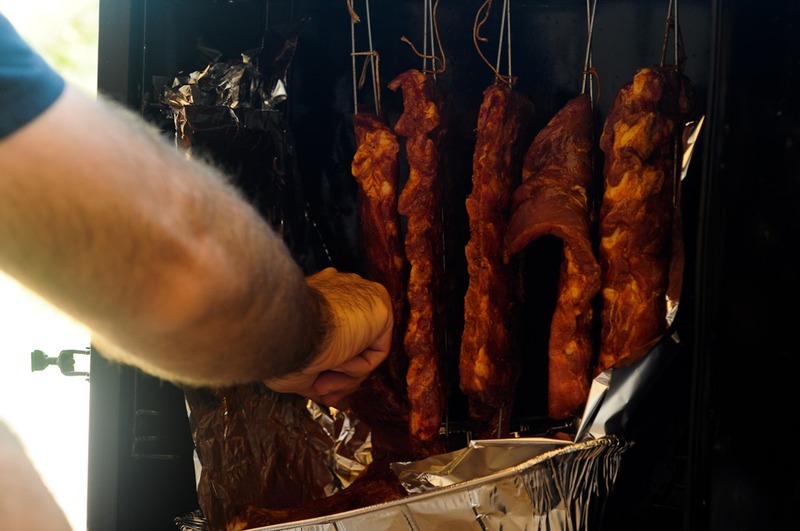 The rack fits snuggly inside the smoker, in fact too snuggly. However, the idea of the design seems sound. 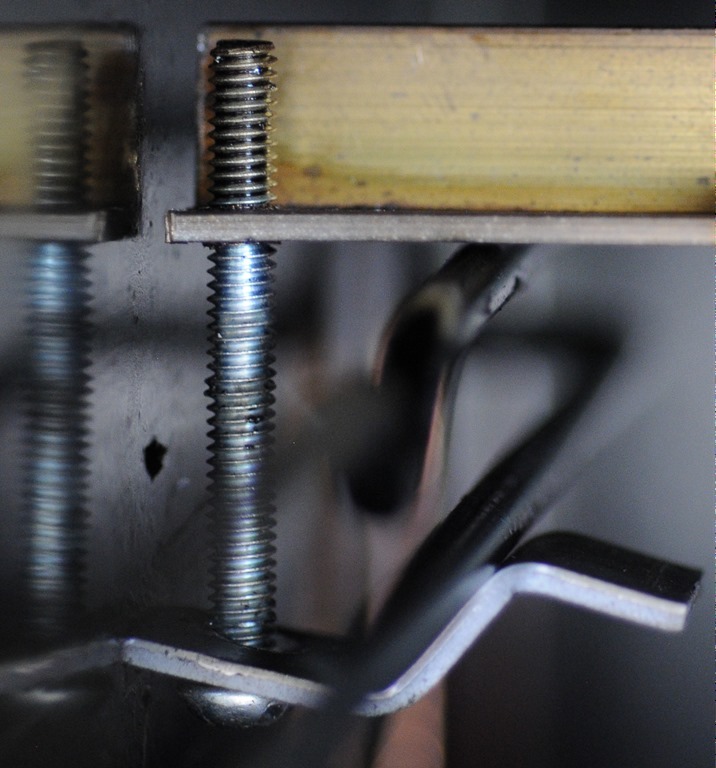 The angle iron rests on the wire slides Masterbuilt included. I use a steel clip. If I redo this, I’ll probably use a threaded hole on the inside of the wire slide, and a fender washer to hold the angle iron on. To load the smoker, I hang the ribs from the screws. 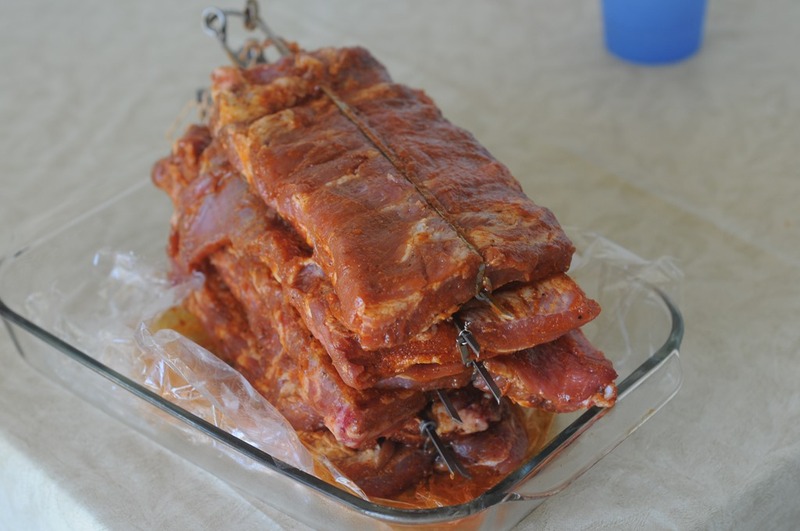 To sauce the ribs, I use tongs to pull a whole rack out. 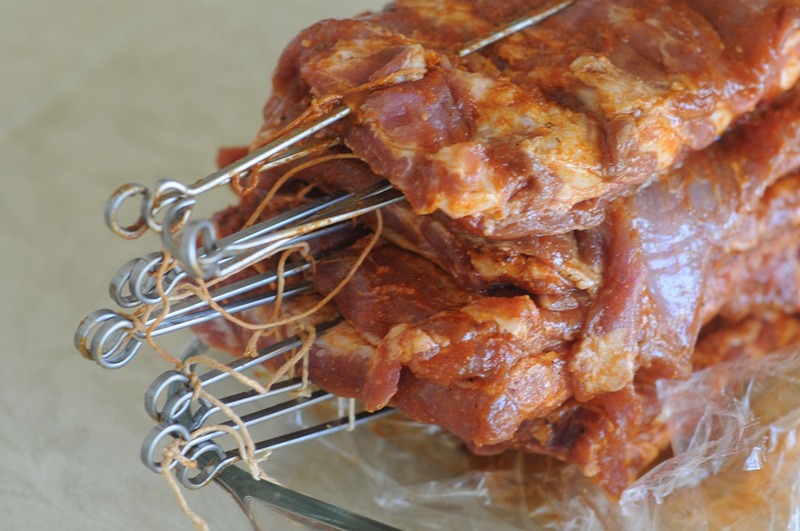 The large rings in the skewer make them easy to take off for a saucing. The skewers’ simple geometry makes them a breeze to clean. They came off the ribs without damaging the crust we work so hard to get. 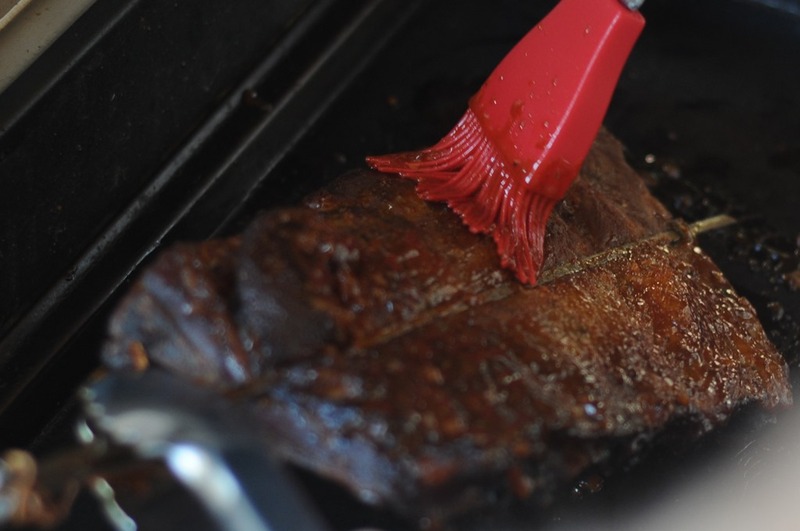 In addition to the easy clean-up, the method causes the fat to drip off the ribs and into a pan, rather than onto the rack of ribs below. The angle-iron hanger rack also works to hang chicken halves with a steel s-hook or a string, also with easy clean-up.